Watching your favourite DJ at a festival can be frustrating experience. Packed into the middle of a tent, a combination of bad acoustics and a PA designed to deliver volume, not nuance, often means the detail that makes a particular artist stand out – and that they’ve lovingly crafted in the studio – is lost in a swamp of murky bass and flat mid-range. It also doesn’t help that there’s usually not a lot of adjustments – sound desk aside – that can be made between acts; everyone has to pump their music through the same, standard speaker stacks sat either side of the stage, blasting out beats in a one-directional manner. Of course, for some, this is irrelevant; lost amid a chemical-induced euphoria, they happily dance around, limbs subconsciously connected to the constant, 4/4 thumps. But for others, more inclined to seek out quality, it could be a source of frustration. Where was the opportunity for DJs and electronic artists to really push the boundaries of their own material, to rip it apart live and re-configure it in exciting new ways? Perhaps the rise of the “just press play” and iPod DJ brigade was just a reaction to crowds demanding spectacle over communion, all too happy to be bludgeoned into submission through decibels alone. James Murphy and Soulwax were one of the first to buck this trend, sinking considerable time and money into their McIntosh Despacio system, a 50,000-watt behemoth consisting of eight 11-foot speaker stacks arranged in a circle and designed exclusively for vinyl. It’s so large and heavy that three articulated trucks are required to transport it, ruling out an extended run of dates or a proper tour. But the idea behind it has gained traction, especially with renowned audio and hi-fi company Bowers & Wilkins. 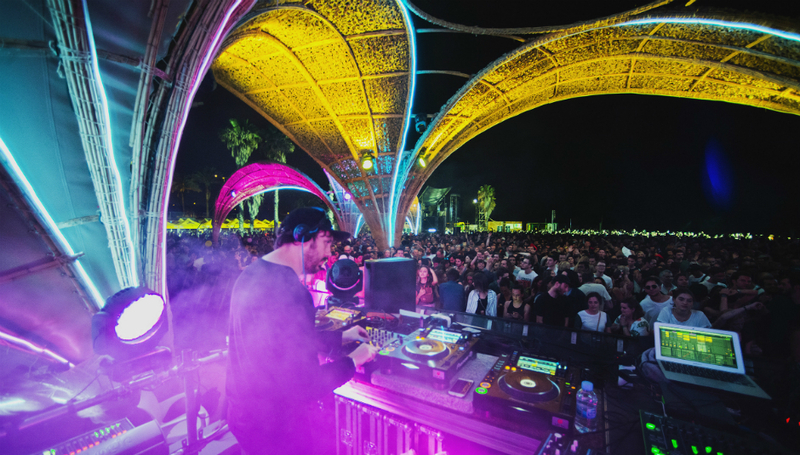 Debuted in 2014 at Primavera Sound, their Sound System has won over some of the world’s most acclaimed DJs and electronic artists, and after several festival appearances over the last few years, it’s back on the road in 2017. A set of four custom built speaker stacks weighing in at five tonnes, each column measures well over three meters and together, they pump out 120,000 watts of power. Designed for clarity and flexibility, the idea is to create an unparalleled closeness between the DJ and the audience and deliver a level of detail alongside volume that has, till now, not been possible in a standard festival set up. Certainly, the lineup that Bowers & Wilkins and Desperados put together tests the limits of the system and showcases its ability to handle pretty much anything an artist can throw at it. From the dreamier, laidback Huerco S to the muddy, driving techno of Joy Orbison, and from the well-polished electro of Aurora Halal to the twisting, textural beats of Avalo Emerson, who spends the thirty minutes before her set dancing wildly backstage, everything sounds spectacular. But it’s local boy John Talabot and his Hivern Discs label mates who really shine. Standing in the middle of the Desperados Club, the sound quality is immense; clear and loud, details can be heard despite the bowel-shaking volume. It’s as if all the separate frequencies of the music have floated free of the bone, with the bass, mid-range, and treble expanding away from each other to create a glorious sense of space in the mix, each part entering your ears separately. Even a stiff breeze blowing in from the Mediterranean, normally the scourge of Primavera sound techs, fails to adversely affect the music. Such technical trickery is not down to the speakers alone, either. I’m given a brief demonstration of the custom mixing desk by the excitable sound engineer Alissandro. One of only two in existence, it looks like something from the Starship Enterprise, all huge touch screens, knobs, and glowing neon buttons. He tells me that he can control not only each stack but each frequency too, meaning you can have the bass and the treble come at the audience from different directions. Even cooler is the touch screen; using just a finger, he can pick out any element or instrument and swirl it around the four stacks in real time. “At WOMAD, we can take a horn and make it seem like it’s swirling around the audience, like it’s circling you,” he says. Infinitely customizable, he tells me it’s an amazing tool to have at his and the DJs disposal, and far more advanced than even the best sound desks. 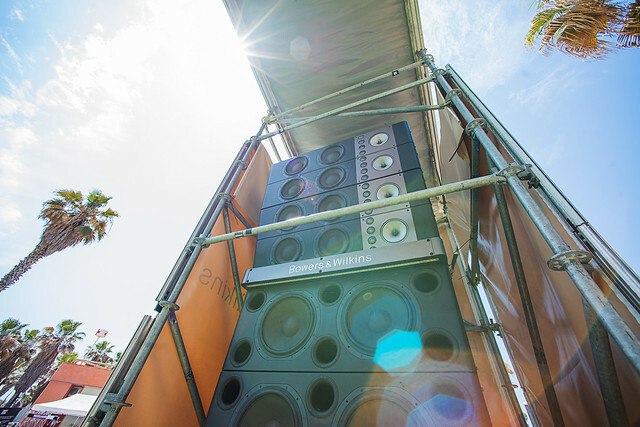 Standing in front of one of the stacks, the power coming through the eight bass cones is immense, and yet even up close, the sound is crisp. But it’s out on the floor where it really makes a difference, and the large crowds the stage draws from lunchtime through to 5 am over three days show that discerning fans value an improved sonic experience and how technology can help foster the spirit of communion that made dance music such a force to begin with. For more information about Bowers & Wilkins Sound System, including upcoming festival appearances, please click here. 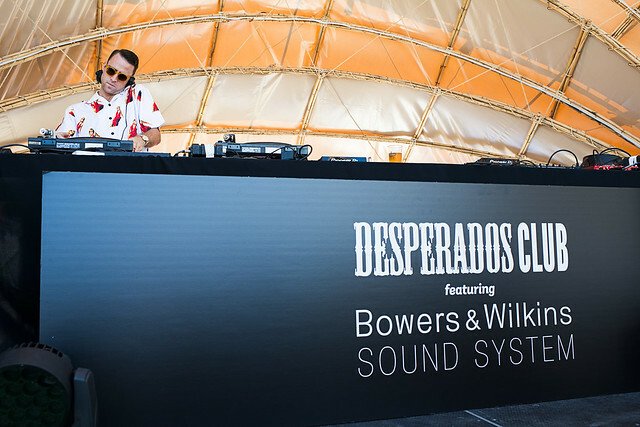 Derek Robertson was at Primavera Sound on 2 June as a guest of Bowers & Wilkins.